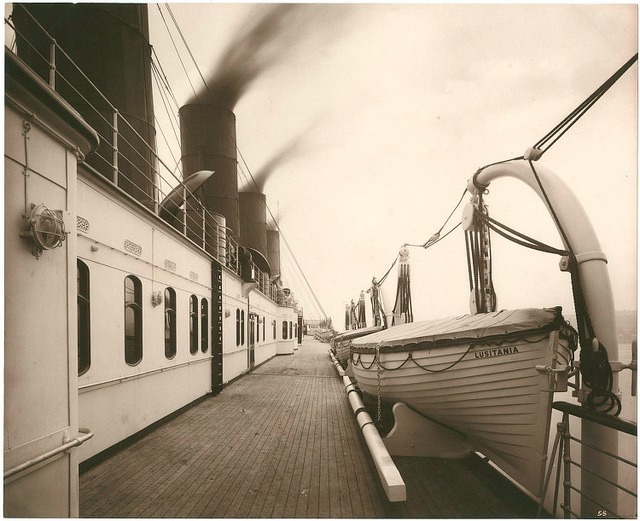 Lusitania’s boat deck. Public domain image courtesy of Wikimedia Commons and Steve Strummer. Interesting how a good biographer makes you care deeply about people you’ve never met or will be likely to meet. My blogger buddy Jaclyn recommended a book about the Lusitania to me, called Dead Wake: The Last Crossing of the Lusitania by Erik Larson. This book is a stunner in many ways. First, there’s the cover design created by Chris Brand and Darren Haggar. Very simple but very powerful — it shows the wake left behind by a large boat in dark water, extending toward a faintly glowing horizon. The color scheme is black and white, a visual hint of the ominous events to come inside the book. The font they used for the title, author and another of his works is elegant (mimicking the character of the Lusitania) and has a Gilded Age/Art Deco feel to it. Larson does a wonderful job in making you care about the people of the Lusitania. After reading a certain part, I found myself wondering: “Did he or she survive?” and flipping ahead in the book to learn what happened. The reaction was a wince or a smile, depending upon that person’s fate. Larson opened my eyes in regard to how many children and families were on the Lusitania. Poor kids. I’m surprised that Larson didn’t mention the story of Ian Holbourn and Avis Dolphin. I would’ve liked to hear his perspective on that. Holbourn, a Scottish professor and a father, befriended Avis, a 12-year-old Canadian girl, on board and made sure she got off safely and back to her grandparents. They stayed friends for the rest of their lives. There are plenty of good stories about the people on both the Lusitania and the submarine that shot her, the U-20. You get a real sense of what conditions were like aboard both vessels. Serving on a submarine during that era was no picnic. There’s also a sense of “What if?” If the Lusitania hadn’t been slightly delayed in her departure, if there had been more fog, or if Captain Turner had received better intel about U-boats in the area, the Lusitania could have escaped destruction. She was just in the wrong place at the wrong time. The saddest — but also the bravest — story that sticks with me is the story of Alfred Vanderbilt. Millionaire sportsman Vanderbilt and his valet Ronald Denyer were going to a meeting of the International Horse Breeders Association. The two of them helped to get many woman and children to safety and Vanderbilt gave away his life vest to a second-class female passenger. Vanderbilt could not swim, so Vanderbilt gave away his only chance to survive and he knew it. (Denyer jumped off later but didn’t survive either.) I sometimes wonder what went through Vanderbilt’s mind in those last few minutes as he entered the water. The coast was there but too far away for swimming. The water was so cold (55 degrees Fahrenheit or 12.7 degrees Celsius). According to Larson, hypothermia starts when the body’s internal temperature sinks under 95 degrees from its normal 98.6. The explosion and drowning got some people; hypothermia got others within one to two hours. Clothing, internal body fat and abstaining from alcohol helped some people survive until they could be picked up. Three hours later, Irish boats went to the rescue and saved as many as they could. Rescue soon turned into recovering bodies, and then there was the hospitalization of the survivors, identification of victims, mass funerals and everything else. What a mess. What a loss.